A complete introduction to ReactJS. Get up and running with ReactJS by learning tooling that improves your development workflow with a focus on ReactJS core API and common How-Tos (e.g. Writing tests, routing, and code splitting). Prerequisites: This workshop assumes that you have at least basic understanding of HTML/CSS/JS. If you know how to add a button element in a HTML and a script tag to trigger events, then you're good to go. Kindly bring your own laptop - this is a hands-on workshop. 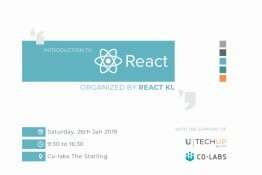 This workshop will concentrate on learning ReactJS from scratch. Developers that is required to use ReactJS in their work and would like to learn more about the tooling and best-practices when using it. Experienced developers working on backend development who would like to start exploring frontend development. - Frontend developers that have experience with other frameworks (e.g. Angular & Vue) and would like to learn about ReactJS. Technology decision-makers that want to understand the features and capacities of React. This workshop assumes that you have at least basic understanding of HTML/CSS/JS. If you know how to add a button element in a HTML and a script tag to trigger events, then you're good to go. Kindly bring your own laptop - this is a hands-on workshop.